Final Presidential Debate Obama and Romney Different Views on Foreign Policy: The U.S. president, Barack Obama, and the Republican candidate, Mitt Romney, have opposed their views on foreign policy in a third and final election debate, which, like the previous two, has been marked by government economic policy. One of the “hot spots” of the debate has been Iran and its controversial nuclear program. Obama has denied that, as published this weekend the U.S. newspaper The New York Times, United States and Iran have agreed to negotiate bilaterally, leaving aside the Group 5 +1 talks. “These reports are not true”, he declared. He has warned it will not allow talks between Iran and the 5 +1 Group – formed by the five permanent members of the Security Council of United Nations (U.S., UK, France, Russia and China) and Germany- – be prolonged indefinitely. “The clock is ticking. Lengthen Iran will not allow these negotiations forever, if we do not go anywhere,” he asserted, while warned: “If they (the Iranians) do not meet the demands of the international community, we will measures “. Romney, meanwhile, lamented that “now we are four years closer to Iran from getting nuclear weapons” and has attributed the progress of the nuclear program of the Islamic Republic of lack of determination of the White House. “One of our biggest problems has been that Iran has looked to the government and has seen weakness, instead of enjoying the American force,” he said. The Democratic candidate has rejected these accusations. “Nothing that says the governor’s true,” he underlined. “Frankly governor seems to think I would have done the same as us, but try to speak louder to somehow sound different,” he added. Both candidates have agreed to not allow the Islamic Republic to get nuclear weapons and that, if Israel is attacked by neighboring Persian remain beside his ally. While Obama has emphasized the condition: “I will be with Israel, if attacked,” he said, which would rule out their support for a preemptive strike Hebrew country. WAR IN SYRIA: On the Syrian conflict, which now totals 19 months, both Obama and Romney have ruled carry out a military intervention, and even establish a no-fly zone – fleeing the Libyan case – while squeezing have advocated the route and diplomatic support to opposition groups. “Our priority is to remove al-Assad,” said the former governor, proposing to arm the rebels do Syrians and “talking with U.S. allies in the region to assume a leadership position” in this case, charging in Obama this point to let the conflict is prolonged. “What is happening in Syria is disheartening and we will do our best to support the opposition,” he argued Obama, while he warned that “employ military means in Syria is a big risk.” “We can not put weapons in the hands of people who can then use them against us,” he underlined. 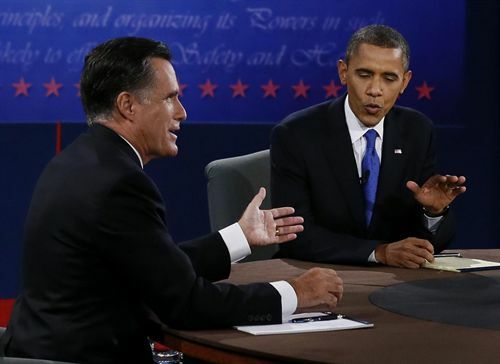 BIN LADEN: Another of the highlights of the election debate has lived when President Romney reminded that once “said it was not necessary to move heaven and earth to pursue (the late Al Qaeda leader Osama) bin Laden”. The former governor has rejected the accusation and explained that his only criticism of government policy in the case is that Bin Laden “should be authorized to Pakistan” before carrying out the mission that killed the head of the terrorist organization. “We would not have completed the mission,” Obama has answered. When asked about the U.S. strategy in the region in order to capture bin Laden, both have defended the drone program (‘drones’). “I support their use and I think President Obama was right to request an increase in our attacks,” stated the Republican candidate. The two candidates have agreed to keep the timetable for withdrawing U.S. troops from Afghanistan, 2014, despite the deteriorating bilateral relations with Pakistan, a key to the stability of its neighbor. Foreign Policy Priorities: From a general perspective, Romney has noted that his foreign policy priority is to fight international terrorism. “My strategy is very clear: chase bad guys,” he said. “We must prevent the rise of ‘jihadists'” has materialized. In this regard, he noted the importance of “carrying out a comprehensive strategy to help the Islamic world to reject violent extremism.” “We need to help these countries, improving education, promoting gender equality,” he argued. For his part, Obama has also considered that the fight against international terrorism is the most urgent goal, but has criticized the former governor for his change of opinion. “I’m glad you now say that Al Qaeda is a threat, because a few weeks ago said that Russia was our enemy,” he recalled. “The Cold War has ended,” he ironized. “But it seems that you want to import the foreign policy of the 80s, like you want to import the social policies of the 50s and the economic policies of the 20s,” he stated. RELATIONS WITH CHINA: Furthermore, the candidates have analyzed the relationship between the U.S. and China, but from a purely economic perspective. Romney has struggled in this thematic, accusing Obama of being too permissive with Chinese policy, both monetary, with the devaluation of the yuan, and industrial levels, with the kidnapping of foreign companies designs. In this case, who has broached the moderator was: “If you are accused of manipulating the first day of the currency, is not going to be difficult to work with China?” He questioned. “We can not pay year after year to these practices,” he argued Romney. However, he clarified that he favored cooperation with the Asian giant. “Of course we can work with China, we have shared interests, and international stability, we need not be at odds,” he explained. Obama, on the same line, has advocated working with China, while the former governor has accused his speech. “He’s right: bad export jobs to China. You know about it because he led a company that exported jobs to China,” he said, referring to Bain Capital.